The current ambassador to El Salvador from the US is Mari Carmen Aponte. In less than a year on the job, Ambassador Aponte has followed a different path from her predecessors Douglas Barclay and Charles Glazer, both appointed by president George W. Bush. And its not just the fact that she is fluent in Spanish. A couple of recent items illustrate what I am talking about. 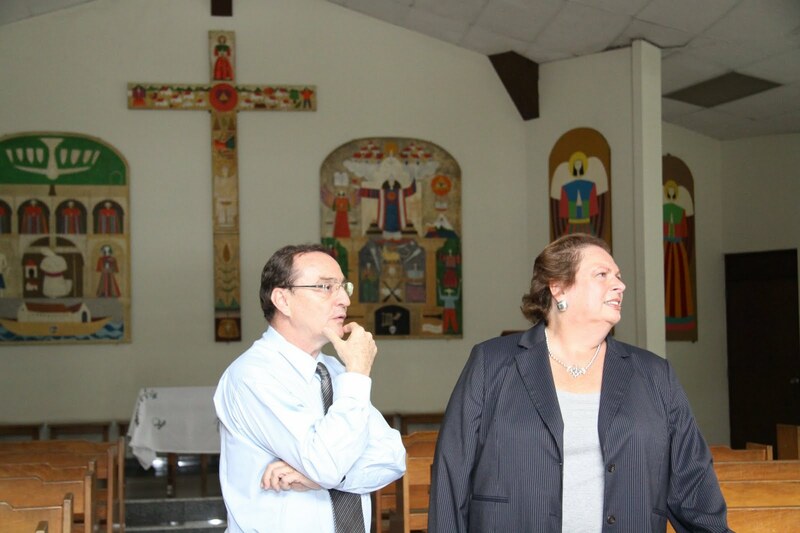 On July 14, the Ambassador visited the Romero Center at the University of Central America (UCA). The center is the site of the November 1989 massacre of the six Jesuit priests, their housekeeper and her daughter by Salvadoran troops. Their murders occurred at a time when the US was providing economic and military support to the government of El Salvador during the civil war. Although the Ambassador did not make any public statements, the symbolism is not dissimilar to the symbolism of president Obama visiting the tomb of Oscar Romero. Here is a photo album from her visit. The second item is an editorial column written by the ambassador which appeared on June 28 in La Prensa Grafica, El Salvador's largest paper, titled For the Elimination of Prejudices Wherever They Exist. The editorial expressed the commitment of the US to the elimination of violence and discrimination against LGBT individuals. The editorial was completely consistent with US policy expressed as recently as the day before in remarks by US Secretary of State Hillary Clinton. The coalition of pro-life/pro-family groups opposed to Aponte’s ideas is comprised of 22 Salvadoran organizations, and 20 other organizations from the Americas and Europe. The group is accusing Aponte of violating international rules of diplomacy and international rights as stated in the Vienna Convention of the United Nations Assembly. This Convention provides that diplomats must abstain from interfering in the internal affairs of other states or countries, while simultaneously respecting the character of said states. The coalition further argued that in “not accepting the legitimacy of ‘sexual diversity’ does not mean [they] are violating any human right.” The coalition rejects the notion that Aponte is defining the progress of human rights in El Salvador as the acceptance and promotion of LGBT issues. The group stated that they “prefer to feel proudly ‘old fashioned,’ keep [their] moral values…and preserve their families,” and to decide what is right and wrong themselves. As I said, Ambassador Aponte is cut from a different cloth than the two wealthy white Republican businessman and political supporters of George Bush who preceded her as ambassador. I'm happy Aponte is here. It looks like a refreshing change. It's absurd that the United States - a melting pot of immigrants from every other world country, should appoint ambassadors worldwide (to this day) who don't even speak the language of the countries they are appointed to. Even more so with Spanish, since it's so widely spoken. So now finally we have one in El Salvador que se habla espanol.